North Lincolnshire is connected to the motorway network via the M180 which runs through the region. 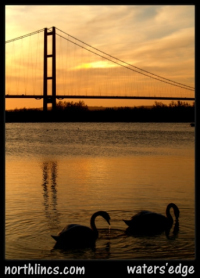 The Humber Bridge also links North Lincolnshire to East Yorkshire. Hull - NorthLincs (30 mins). Lincoln - NorthLincs (30 mins). Leeds - NorthLincs (1 hour). York - NorthLincs (1 hour). Sheffield - NorthLincs (45 min). Direct Rail Link less than 2 hours away. Local and express services run throughout the area. For Further information contact Tourist Information Centre. Humberside International Airport Located in North Lincolnshire. Robin Hood Doncaster Sheffield International Airport Located just outside North Lincolnshire. Manchester Airport - Scunthorpe Direct Rail Link less than 2 hours away.